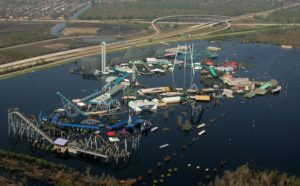 A significant problem encountered after a flood event is the loss of jobs and economic activity that is driven by the damage to businesses and manufacturing facilities. The destruction of equipment, inventory and data causes many privately held companies to, at best, temporarily cease operations. The cascade effect of these closures means extended layoffs for many employees, interruption of the flow of goods produced and sold, reduced profitability, local tax base decreases and dampened local, regional and national economic activity. In most instances, the costs go far beyond removing the sludge, washing down the walls and replacing a few office chairs. Repair and/or replacement of advanced manufacturing equipment, computer systems, recreation of sophisticated data systems, raw materials or inventory replacement and significant gaps in the revenue stream create long term financial woes for both the companies and the people who work for them; 1 in 4 will never open for business again. There are some typical methods that help businesses bridge these types of losses. Flood insurance can offer a buffer between losing everything and losing just a portion of everything, but flood insurance premiums are extremely expensive and rarely cover all of the owners expense. FEMA suggests raising the elevation of structures and equipment, but raising an entire commercial or manufacturing building is rarely practicle or even feasible and elevating equipment platforms, inventory storage systems and working platforms can conflict greatly with OSHA safety regulations. Even if a company chooses to purchase flood insurance, the damage still occurs, cleanup must be made, data systems must be restored, machinery and inventory replaced; this process takes months to implement. Unlike some government grant assistance programs for individuals, the best that a company can hope for is a low interest SBA loan to replace some of the items that are not included in flood insurance coverage. Either way, the loss of income and asset value has a severe, detrimental effect. Wouldn’t it make more sense to protect the facility from flooding? Wouldn’t it benefit the owners, employees, local communities and the taxpayers of this nation to invest in protecting these revenue producing, economic drivers? What is the downside of keeping businesses functioning, retaining taxable property valuations, keeping the doors open for people to make an honest living and maintaining or even enhancing our nation’s GDP? With flood protection systems we can accomplish all of these things; for just a fraction of the cost. If we choose to do this, we can be sure that when the flood waters receed, businesses can resume normal operations, employees will retain their current income levels and the economy will not suffer; a benefit to everyone. The other option is to continue with the failed system of flood “reaction”; a system that costs American taxpayers over $30 billion/year in flood “assistance” alone. 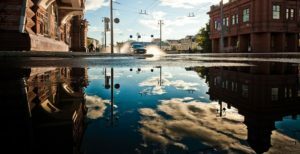 Are business owners wise enough to invest in flood protection and and are we, as a nation, wise enough to switch our focus from reaction to protection? We can hope. For more information on how to protect your facility from flooding, feel free to contact Jeff at jeffthieding@t3investmentsllc.com. Jeff Thieding is the Managing Partner of T3 Investments and the Inventor of the Rapid Guard Flood Barrier System. Monday – rain, Tuesday – rain, Wednesday – more rain, Thursday, nearby rivers have started to flood the lowland areas and still no end to the rain in sight. By Friday, the National Weather Service has issued a flood warning for the area and still the rain continues to fall. You feel OK. Your home/business has never flooded. You’re not in a low land area. By Saturday, over 10″ of rain has fallen across much of the region. Yes, the flood waters have reached near historic levels, but your property doesn’t have water coming in the doors. Again, you think that it still may be OK. Suddenly, the lights go out. Within an hour, water starts backing up through the floor drains and the toilets. A fowl odor engulfs the building; this isn’t clean water, it’s sewage. You scramble to grab your cell phone, a few personal belongings and an extra change of clothes. Time to leave. Even if a home or business isn’t located in an area where overland flood waters crest higher than the first floor elevation, there is no assurance that the property will not experience devastating flood damage. Flooding of critical infrastructure (i.e. electrical transformer stations, waste water treatment facilities, sanitary lift stations) causes major damage to tens of thousands of homes and businesses each year. Whether it’s a sanitary sewer lift station that loses power or is inundated by flood waters, a catastrophic failure of the area’s WWTP or an electrical substation that goes offline because water has reached the transformers, the problems experienced are the same; loss of service, resulting in backflow of raw sewage into properties that would normally have avoided damage. That’s unacceptable. More can be done to protect critical infrastructure from flood waters. One answer is to fix what has been damaged, ignore the problem and hope that it won’t happen again. Although this seems foolish on paper, it is exactly what many of our communities, businesses and utility providers have been doing for years. Another is to rebuild these facilities at higher elevations. While this seems to be a common sense approach, the cost ($100,000 to >$10,000,000/each), locational necessity and environmental regulations restrict communities and utility providers from implementing. The final option is the implementation of a flood protection system. These temporary and/or permanent systems offer all of the protection at only a fraction of the cost of facility relocation, modification or reconstruction. The time necessary to implement and avoiding many of the environmental, land acquisition and planning headaches that relocation and/or rebuild to a higher elevation at the same location are distinct benefits. Dealing with flooding issues in a timely, cost effective method makes sense on so many levels. The option of flood protection has been overlooked for far too long; to the detriment of both American taxpayers and those who suffer repercussions of having critical infrastructure go offline. How individuals, business groups, municipalities and utility owners choose to deal with these significant challenges is important. It may not have affected you yet, but it could in the not so distant future. Be wise, prepare and protect critical infrastructure from flood waters. Is It Time We Take a Look at Flood Protection Systems? Flooding events are our nation’s most costly natural disasters. It seems that almost every month there is another severe flood affecting the continental United States. People are displaced from their homes, electrical systems are inoperable, wastewater treatment facilities cease to function, businesses are shuttered and critical services (police, fire, hospitals) are severely impacted. To date, our national response has been focused on a “reactive” approach; flood insurance, direct assistance payments through government grants and loans, buyouts of properties in flood prone areas. What if we could do better? What if we could protect properties from overland flooding, rather than react after the fact? What if we could save people’s possessions and preserve their financial well-being? The answer is flood protection. Today, there are a number of flood protection systems that can protect areas from the effects of overland flooding. Some are permanent systems that self-deploy as the flood waters rise. Others are temporary structures that are put in place when the threat of overland flooding becomes evident. All have positives and negatives; price, usage limitations and/or vulnerabilities. However, they all do one thing that reaction based support cannot do; they allow utility providers, municipalities, EMS, businesses and homeowners the ability to protect and retain their assets. 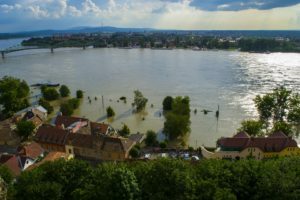 A recent study of European nations found that for every euro invested in flood protection, four euros were saved when a flooding event occurred. For U.S. taxpayers, who currently provide over $30 billion/year in flood assistance, this could mean large savings over time. Hurricanes Harvey and Irma alone have estimated costs of over $100 billion each. It is impossible for us, as citizens, to continue providing “reactive” assistance at even a fraction of the levels needed just to provide for the repair of basic structural and mechanical damages; say nothing of the loss of all personal possessions of those who have been direct victims of the flood waters and the loss of economic activity for businesses. It’s time that we make the transition from a “reaction” bases approach to a “protection” based approach. Flood protection is the answer. © 2019 Rapid Guard Flood Barrier System. All Rights Reserved.